Home/2016, 2016, Announcements, EuroGames, News/Inspirational Additions to the “Against the Rules” Exhibition. The EGLSF is proud to unveil 2 new additions to the "Against the Rules" Exhibition. 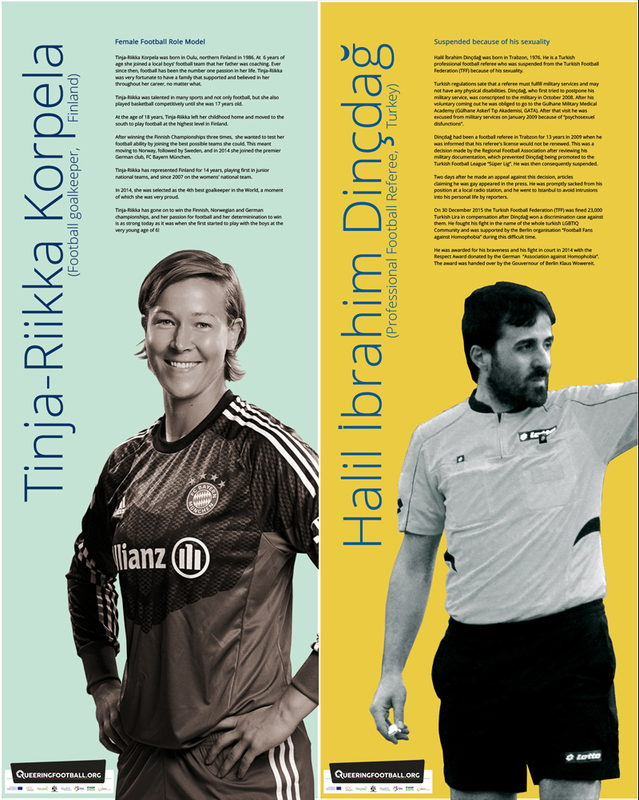 Over the past number of months the federation has been looking for inspirational athletes to join the exhibition and after long discussions we are happy to welcome Finnish Professional Goal Keeper for FC Bayern München, Tinja-Riikka Korpela, and Turkish Professional Referee, Halil İbrahim Dinçdağ. This update is part of the Queering Football, Erasmus+ project that the EGLSF is partnering in for the next 2 years. The EGLSF and FSGL are proud to be hosting a mobile Euro Pride House in France during the 2016 UEFA European Football Championships this summer, and the exhibition will be visible throughout France during the tournament. Tinja-Riikka Korpela was born in Oulu, northern Finland in 1986. At 6 years of age she joined a local boys’ football team that her father was coaching. Ever since then, football has been the number one passion in her life. Tinja-Riikka was very fortunate to have a family that supported and believed in her throughout her career, no matter what. Tinja-Riikka was talented in many sports and not only football, but she also played basketball competitively until she was 17 years old. At the age of 18 years, Tinja-Riikka left her childhood home and moved to the south to play football at the highest level in Finland. After winning the Finnish Championships three times, she wanted to test her football ability by joining the best possible teams she could. This meant moving to Norway, followed by Sweden, and in 2014 she joined the premier German club, FC Bayern München. Tinja-Riikka has represented Finland for 14 years, playing first in junior national teams, and since 2007 on the womens' national team. In 2014, she was selected as the 4th best goalkeeper in the World, a moment of which she was very proud. Tinja-Riikka has gone on to win the Finnish, Norwegian and German championships, and her passion for football and her determinination to win is as strong today as it was when she first started to play with the boys at the very young age of 6! Tinja-Riikka is also one of our EuroGame's Ambassadors for this years games which will be held in Helsinki this June 19th - July 2nd. Halil İbrahim Dinçdağ was born in Trabzon, 1976. He is a Turkish professional football referee who was suspended from the Turkish Football Federation (TFF) because of his sexuality. Turkish regulations sate that a referee must fulfill military services and may not have any physical disabilities. Dinçdağ, who first tried to postpone his military service, was conscripted to the military in October 2008. After his voluntary coming out he was obliged to go to the Gulhane Military Medical Academy (Gülhane Askerî Tıp Akademisi, GATA). After that visit he was excused from military services on January 2009 because of “psychosexuel disfunctions”. Dinçdağ had been a football referee in Trabzon for 13 years in 2009 when he was informed that his referee's license would not be renewed. This was a decision made by the Regional Football Association after reviewing his military documentation, which prevented Dinçdağ being promoted to the Turkish Football League “Süper Lig”. He was then consequently suspended. Two days after he made an appeal against this decision, articles claiming he was gay appeared in the press. He was promptly sacked from his position at a local radio station, and he went to Istanbul to avoid intrusions into his personal life by reporters. On 30 December 2015 the Turkish Football Federation (TFF) was fined 23,000 Turkish Lira in compensation after Dinçdağ won a discrimination case against them. He fought his fight in the name of the whole turkish LGBTIQ Community and was supported by the Berlin organisation “Footballfans against Homophobia” during this difficult time. He was awarded for his braveness and his fight in court in 2014 with the Respect Award donated by the German “Association against Homophobia”. The award was handed over by the Gouvernour of Berlin Klaus Wowereit. Homophobia – prejudices and violence against LGBTIQ footballers – is still one of the main and untackled problems in European football. Homophobic chants and physical attacks as well as ignorance and exclusion still happen on a daily basis. With "Queering Football - Tackling Homophobia and Promoting Anti-Discrimination around Major Sport Events" (2016-2017) we want to raise awareness for a wider recognition of homophobia as a main problem and create an inclusive football and fan culture where respect is celebrated and solidarity is cherished.